What dance genres do you practice? I specialize in stilt dancing, literally dancing while mounted on 4’ (usually) stilts. I favour “peg” stilts which are attached firmly to the legs and end in single points on the ground, requiring constant movement/weight shifting, as opposed to hinged drywall stilts which allow standing still and are favoured by some clowns and other stilt walkers. My style has evolved over 15 years, incorporating training from modern, ballet, Hip Hop, Afro-Caribbean dance, contact improv, Capoeira, Butoh and more. People typically associate stilts with Circus Arts, but I have used them in choreographed dance theatre performances, and these days I focus on presenting my own unique blend of interactive, improvised performances for crowds. My dance training allows me to push the envelope beyond stilt walking to stilt dancing, and audiences respond very favourably. I was born in Kitchener, lived in Toronto for a year as a kid, then moved to Indianapolis, Indiana where I grew up. I studied African/African-American Studies in college, including a term abroad in Zimbabwe. I’ve spent time travelling in Jamaica and Guatemala, and presented stilt artistry in Trinidad and Tobago and Easter Island. I spend five years as Managing Director of a non-profit multimedia dance company in Cleveland, Ohio, before returning to Toronto in 2005 to have children and raise my family. When I moved back to Toronto in 2005 I made the hard choice to leave the arts as a full time professional artist…too daunting to hustle through the feast/famine cycles while starting to raise a family. However, I founded my own stilt dance company Stiltdancer in order to have an outlet for my passion and keep a (long) toe in the arts. I do miss the dance studio though, and sharing the challenges, hardships, and triumphs that so many dancers know all too well. Joining CADA was a way for me to reconnect with my identity as a dancer and to add my voice to the dance community as a movement artist who followed a non-traditional path to a unique movement expression. OK, yes, I’ll admit it…the training subsidy is awesome too! How do you keep your body performance ready? It is hard to do, especially as I now work a desk job as a public servant with the Ministry of Health and Long-Term Care. I am guilty of training less rigorously and less often than when I was a developing/emerging artist. I don’t follow a regular training schedule, but fit in whatever workouts I can whenever I can, including daily cycling (to commute), pick-up soccer and basketball, the odd yoga class, occasional cross-training/boot camps as gigging season approaches (warm weather), and my own ongoing blend of calisthenics, body-weight based strength training, running and stretching. Playing hard with my kids also helps! In the end, stilt dancing itself, as a high-intensity high-impact performance mode probably does more to keep me in performance shape than anything, so a good warm-up before gigs and going all out during shows keep me as fit and in top form as anything. I have a couple grants in with various arts councils to try and expand Stiltdancer’s offerings not just as a provider of cultural entertainment, but also more as a creative producer. Typically I am busy through the warm months with a steady rotation of appearances at Festivals and Events around Ontario, especially including involvement with Toronto’s Scotiabank Buskerfest. 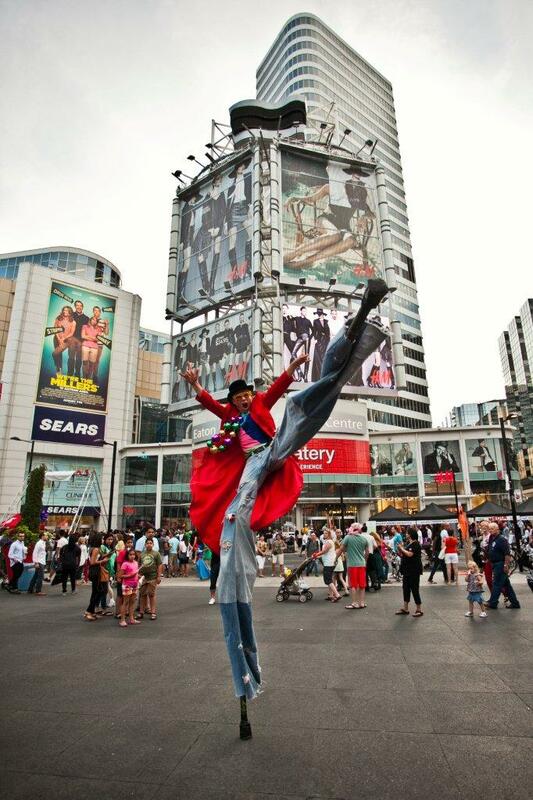 I have been a featured roaming act with Buskerfest for 6 years, and lately have expanded my role to train and coordinate additional stilt artists to join in sharing big fun in the street. Last year I helped to coordinate local stilt artists in collaboration with a Montreal-based group to present the major “splash act” of the festival, featuring a giant elephant on rollers. My vision for a funded project is to work with a costume designer I have collaborated with in the past to create a Toronto-grown spectacle on the scale the festival needs, but custom tailored to share a story in the road and better engage the hundreds of thousands of festival attendees that jam pack Yonge street for 4 days. Also, I know I need to keep developing my dream of a Stiltdancer Academy to pass on more of what I have learned and share this unique art form which has been such a passport for me to live and work professionally as a movement artist. 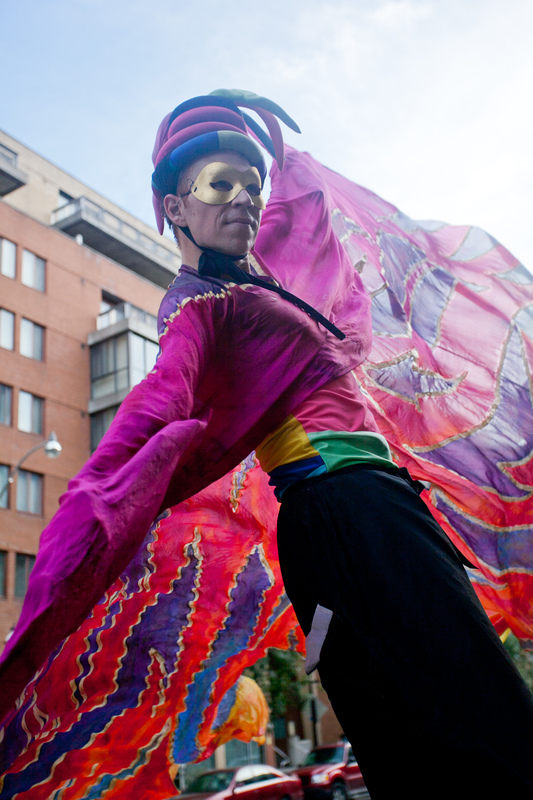 Ezra would be thrilled to hear from any CADA members/supporters, who are welcome to contact him directly at ezra@stiltdancer.ca or 647-402-7535. Photo by Jona Stuart, Staticflux Photography.